extract from the orders issued by Colonel Sinclair-Maclagan to the 3rd Brigade before the Gallipoli Landing. Battalion (South Australia), the 11th Battalion (Western Australia), and the 12th Battalion (South Australia, Western Australia, and Tasmania). The Headquarters and two companies of the 12th Battalion were Tasmanians, the remaining two companies being from South Australia and Western Australia, respectively. South and Western Australia therefore each had five companies in the Covering Force, four companies were from Queensland and two from Tasmania. The Australians were to be the first troops to land on the Gallipoli Peninsular the British landings were undertaken later in the morning. The British bombardment further south at Helles commenced at 5.00am. At the time of the landing, a Battalion at full strength numbered around 1000 men and a Company numbered 250 men. Thus there were 4 Companies to a Battalion. The 4 Companies within each of the Battalions of the 1st AIF were alpha coded A,B,C, and D*. The covering force was to be landed in two waves. In the 1st wave, 1500 men were to be landed and 2500 men in the 2nd wave. The 2nd wave landed some 20 minutes after the 1st wave so for this discussion about the first men ashore at Anzac our concern is only with the men in the 1st wave. What were the Australian Battalions of Men who First Landed at Gallipoli? * Note- When the AIF first left Australia there were 8 Companies (125 men to each rifle Company) allotted to each Battalion but this was changed in Egypt to align to the British Army. On the 1st January 1915 the Australian Battalions up to then consisting of eight companies were reorganised on a four-company basis. The way that Companies were merged was different in each Battalion. For the 11th Battalion, the original “A” and “B” amalgamated into the new “A” Company and “C” and “E” becoming the new “C” Company. For the 9th Battalion, the original “A” and “C” amalgamated into the new “A” Company, - “B” and “D” becoming the new “B” Company. - “E” and “G” the new “C” Company and “F”& “H” the new “D” company. Every Australian AIF Battalion stationed in Egypt changed from the 8 to the 4 Companies basis on that date. Unfortunately, the method of merging was left to each Battalion HQ, so there is no consistency. Each of the Companies were subdivided into four platoons. At the time there were Platoon Rolls but none of these have survived. How to Find if a Soldier was in the First Wave Landing at Gallipoli? People who are wanting to know in what boats their forebears were at the landing need only know the company that they were in at embarkation from Australia (available at the AWM website) then use the above explanation to convert to the new merged Company. If the soldier was in the 1st wave companies (shown above) then it is reasonable to assume that he took part in the 1st wave landing. But (a big 'But') you would need to check the soldier's service record for any unit transfer, sickness/hospital transfer dates, to ascertain that the soldier was actually "On Strength" at the time of the landing. The soldier’s service records are available at the Australian Archives site. On the soldier's record look for any mention of the Company that the soldier was in when 'taken on strength' (abbreviated on records as 'TOS') ascertain the date then compare if before the 1/1/1915 he was in the 'old' company and after this date he was in the 'new' merged company. A confirmation that the soldier was part of the 3rd Brigade MEF, Mediterranean Expeditionary Force (the Force from which the 1st Wave were selected) is to look on the Casualty form for the entry, "Emb to join M.E.F. Alexandra 2/3/15". This entry was made when the 3rd Brigade embarked on the 2nd March 1915 for the island of Lemnos, the harbour of which was known as Mudros. Further confirmation can be seen on the Casualty form if there is an entry for being wounded, missing, killed in action on the 25th April 1915. If in the case of becoming missing or being killed also check the Red Cross records at the AWM. Another source of confirmation, especially for family history genealogy researchers is to check family stories about these soldiers. Contact the oldest person in your family and ask them if they remember any stories about the soldier. Check Trove for newspaper entries. The Australian Battalion History Books are also full of information about happenings and soldiers within the Battalion. Try to ascertain the Company/Platoon commander's name as many times this individual will be mentioned in histories but the entry will refer to the overall group he commanded. This is especially the case with the Bean Official Histories. Each of the Battalions had a contingent of Scouts. The Scouts were obviously a group of soldiers from the Battalion selected for superior qualities. They were committed to important tasks upon landing eg locate and destroy the Turkish artillery. It would seem from scant evidence that the Scouts were sitting in the bow of the first boats to afford them the best possible advantage to be first ashore. The 9th Battalion Scouts were divided so that the first rowboats on the Starboard side and the first rowboats on the Port side had Scouts on board. Thus it is possible that some of the scouts were selected from other Companies of the Battalion than the ones that took part in the 1st wave landing. It is documented in the 10th Battalion History that the first boat being boarded from the Prince Of Wales Battleship was in part reserved for the Battalion Scouts. Thus it is not surprising that several of the claims of being first ashore come from members of the Scouts of the various Battalions. Many members of the Battalion’s HQ were to land in the Battleship tows. General Birdwood and his staff were on board the Queen and General Bridges and staff were on the Prince of Wales - of course these men did not land till later. However, Brigade HQ Staff landed with the 2nd wave. For example, Brigade Commander, Brigadier General E.G. Sinclair-Maclagan was giving commands on the Beach within 20 minutes of the initial Landings. He had landed in the 2nd wave with "D" Company 9th Battalion and had first noticed gun fire when his boat was 30 yards from shore. Some of the tows of the 1st Wave included a Battalion medical contingent (eg 9th Battalion Medical Officer Captain Graham Butler lead men of the 1st Wave up the steep hill leading to Plugge's Plateau). The 3rd Field Ambulance (the famous Pte J Simpson KIA 19th May 1915 was part of the 3rd Field Ambulance) landed later with 12th Battalion as part of the 2nd wave. They landed at 5.00am at North Beach directly in front of the Sphinx. What were the Row Boats being used during the Gallipoli Landing? The rowboats and steam boats used by the covering force were supplied from all the Battleships allotted to the landing. The rowboats assembled to land the men were not all the same size but consisted of Life boats and Cutters (normal carrying capacity around 30 men), Pinnace (60 men) and a Launch (98 men). Each tow was to be made up of three rowboats comprising (could vary), 1x Lifeboat 1x Cutter and 1x either a larger Pinnace or Launch. These boats were made of either timber or metal. Each of the line of three rowboats was to towed to the beach by a Steamboat/Steam Picket. There were twelve tows, of total 36 rowboats in the initial landing. The men of the first wave covering force were to be loaded into the rowboats from the three battleships as shown above. Two of the rowboats that were used on the 25th April 1915 (but not the 1st Wave) are part of the Australian War Memorial Collection. What were First Anzacs Trying to Capture on the 25th April 1915? The Covering Force objective on the day was to capture the Sari Bair range from Gaba Tepe, on the right, to Chunuk Bair a high hill about two-thirds of the way up the ridge towards the summit of the range. 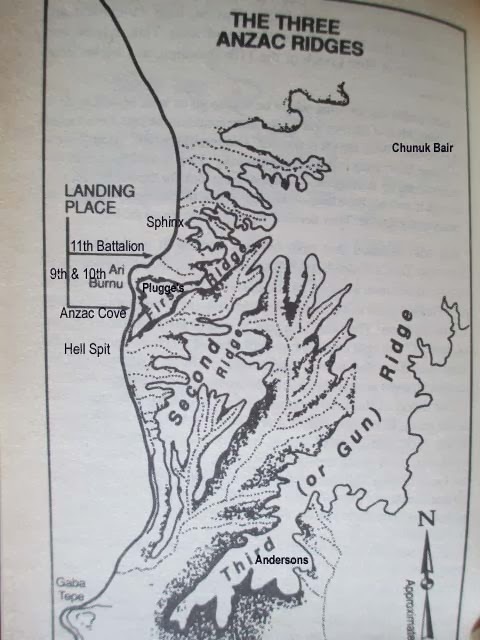 To accomplish this it would have to seize three ridges, which branched off the main range just below Chunuk Bair (the south western slope of Chunuk Bair was named Baby 700). The three ridges were known on the day of the landing as First, Second and Third Ridges. The Third Ridge was about 1.6 km from the proposed landing place (about a 2kms north of Gaba Tepe). This part of the Third Ridge would become known as Gun Ridge, from the fact that most of the Turkish artillery batteries were posted behind it. It was intended that the 9th Battalion should land on the right of the covering force and seize Gaba Tepe and a rise on Gun Ridge which would become known as Anderson Knoll. The 10th Battalion, which was to land in the centre, was to seize another rise on Gun Ridge about 3kms north of Anderson's Knoll, known as Scrubby Knoll, while the 11th Battalion landing on the left, was to occupy the rest of the range as far north as Chunuk Bair. The 12th Battalion was the reserve of the covering force. These objectives proved to be ambitious. What was the Time of the Anzac Landing at Gallipoli on 25th April 1915? Historically much has been written and debated about the incorrect location of the landing. Suffice to say for this discussion we are only interested in the times of the actual landing. Important times 25th April 1915 timeline to landing. 12.00 Midnight men were awoken on the three battleships. 1.30 am The loading of the rowboat tows began. 2.35 am Loading of men into all tows completed. 2.35 am The Battleships moved off towards the Turkish Coast. The tows with steam boat follow. 3.40 am The order “ Go ahead and land” was given by Admiral Thursby for the tows to be cast off. The journey to the beach was expected to take 50 minutes. The 12 steamboats with tows then made for the beach - 3 row boats per tow thus 36 rows in total. Two search lights beam out ahead of the boats from the direction of the Dardanelles fortunately the lights were too low and distant to reach the boats. 4.10 am The destroyers carrying the 2nd wave were ordered to follow. 4.29 am there appeared a yellow light or flare flash occurred for 30 seconds on a southern knoll just to the right of rowboats (1km to the right thought to have come from Queensland Point/Hell Spit/Little Ari Burnu). On 25 April 1915 the moon rose at 2.11 am and set at 2.58 am sunrise was at 5.11 am at Gallipoli. 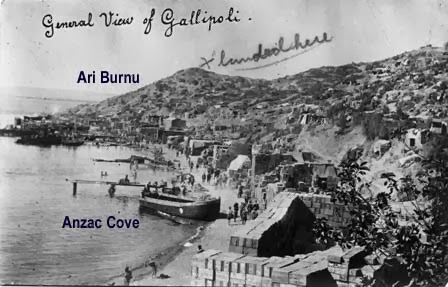 The first boats ashore grounded near the point of Ari Burnu (see map postcard above) and were from the 9th and 10th Battalion as 'most' of the 11th Battalion boats on the left missed the point. As Ari Burnu fell away to North Beach, this meant that the 11th Battalion men had a further 180 metres to row to the beach under fire. The above times are mainly taken from the Official Histories. Charles Bean would have procrastinated for many months over much inconsistent information to ascertain 'forever more' the true time of landing. An example of "inconsistent information" is the story of Major Beevor commanding the 10th Battalion "A" Company. Major Beevor although part of the 2nd wave was privately rowed ashore in a Naval Commanders dinghy. They experienced enemy fire on the way and due to anticipation, Beevor jumped from the dinghy too early. He was swamped under water but successfully made the beach. Later he found both of his watches had stopped at 4.22 am. Around '8 minutes' before the 1st wave landed - a good example of the inconsistency of 1915 timing. Must be remembered that we are talking about 1915 and watches being worn onto Gallipoli need not have been precisely centrally set nor in many cases capable of tracking time to today's standards. Pte Adil Sahin 2nd Platoon, 4 Co, 2nd Battalion 27 Regiment, Ottoman 5th Army. Sahin was located in trenches on Ari Burnu directly above the Australian Anzac Landing. The duty sentry awakened them urgently, ' he shook us and pointed down the slope to the water below'. Sahin said, 'He said he thought he could see shapes out there on the water. We looked out and strained to see in the half light and then we heard noises and saw shapes of boats with soldiers coming ashore. We were ordered to start firing. Some fell on the beach and I wasn't sure whether we'd hit them or they were taking shelter. They made for the base of the rise and then began climbing. We were outnumbered so we began to withdraw. It was very confusing...We didn't know anything of the invasion. We were very scared and retreated to the second ridge, firing as we went. I was very frightened." Sahin was a 16 year old shephard boy from Buyuk Anafarta village north of Hill 971. He was interviewed in 1985 and 1987 for ABC TV documentaries. The above entry come from the book 'Gallipoli The Turkish Story ' by Fewster, Basarm and Basarm. If you wish to research more about the Turkish Gallipoli Story please see this 2015 book, " Defending Gallipoli The Turkish Story " by Harvey Broadbent or a 1920's account 'CAMPAIGN IN GALLIPOLI ' by Hans Kannengiesser﻿ . The identification of the first Australian to land onto the beach at Gallipoli has always been a contentious issue. Historically the Landing is one of, if not the most defining event in Australia's history. Due to the prestige and honour of being the first ashore newspapers/media, the soldiers, public have shown much interest in acknowledging the first individual man to step ashore. As you see from above maps etc. the first boats landed on a knoll called Ari Burnu some of the rowboats landed on the right-hand side of the point and some on the left. But the rowboats that struck the point were the first to reach land. Thus from the outset men could have been stepping onto the shore seeing that they were the first to do so but not knowing around the corner another boat had landed. Add to this that the landing was undertaken at the crack of dawn in virtual darkness - quite a quandary. The Official War Correspondent and Sydney Morning Herald journalist Charles Bean for years researched and tried to ascertain the name of the first man ashore. Claims of being the first man ashore mainly came from members of the 9th Battalion and 10th Battalion. The majority of 11th Battalion rowboats landed to the left, missing the point and had further to row before landing on North Beach. Additionally, as there was a strong northerly sea current the 11th Battalion boats were bound to drift further north. Another consideration was the size of the boat, the smaller rowboats were able to get closer to shore before they grounded. The larger "launches" and "pinnaces" grounded in deeper water. It was generally from these boats that men were fully immersed with some drowning. At the time there were many that claimed themselves as being first ashore. Due to the confusion and dark conditions, legitimately, many thought they were the first to land. Luckily, there was an event that everyone could recall, that was the sound of that first rifle shot. Bean concentrated on where the soldiers were located when they heard that first rifle shot. He looked for accounts where the soldiers had claimed they had landed before the first shot rang out. There were very few. In the first edition (Published in 1921) of the Official History of Australia in the War of 1914 1918 Volume 1 The Story of Anzac written by Charles Bean. He states that, "Three boats near the point had become so locked that only those on the outside could use their oars. One of these, containing men of the 9th Battalion and Captain Graham Butler, their medical officer, and a boat of the 10th Battalion, with Lieutenant Talbot Smith and the scouts of that Battalion, were among the first on the point." But in a preface to the 2nd and later editions Charles Bean names the first man ashore as Lieutenant Chapman and cites evidence from 1010 9th Battalion Scout Sergeant Coe (at times used an alias of Mr F C Kemp see below for more details) whose statement writes, "we touched shore and Lieutenant Chapman was the first ashore. 616 Private AK Wilson of the scouts was taking my pack off when the first shot rang out: a pause: then seven more"
In 1955, Bean wrote a Chapter in an AWM book titled ‘Australia At Arms’. The chapter that Bean wrote was called ‘First Hours At Gallipoli’. Below are some interesting excerpts from that account. ”It will never be known with certainty who was the first Australian to land on the Gallipoli Peninsula on that famous morning of the 25th April 1915… When the moon sank...it was intensely dark…during most of the journey (to the beach) none of the soldiers crowded in the boats could even see the tow next to them…a protruding knob of the land (Ari Burnu) seemed almost on top of them when from the funnel of one of the tugging, chugging steamboats there streamed for 20 seconds a full three feet of flame. The crews had tried to prevent this happening but it was not easily avoided. Almost immediately on the summit of another rather lower knoll (Queensland Point [also known Hell Spit]), about a thousand yards to the south there began to flicker a smaller bonfire. On the skyline high above the boats appeared a man. On top of the nearer knoll (Ari Burnu) a rifle flashed then came a group of four or five shots, and with a run the firing quickened into a continuous irregular fusillade. Most of the boats packed with troops were at that moment 50 to 100 yards from the land. The small towing boats had thrown off or were throwing off (rowboats) and the soldiers were paddling them quickly to the land. Some shots were going home both in the boats and among the troops who scrambled out, when the boats grounded, and waded ashore. There the fire struck sparks out of the shingly beach as the Australians rushed across it to shelter under the bank that fringes nearly all the beaches and to line up for immediate attack. The troops could dimly see one another and from nearly all the boatloads in this first batch there came afterwards the same account. But from that day there was always a tradition that part of the 9th Battalion (Queensland) battalion was first ashore; a Scout-Sergeant of that battalion (a Queensland farmer, Mr. F. Kemp [alias used by Coe]) stated some years after the war that his boatload had scrambled ashore and was taking off its packs when the first shot rang out. Of that boatload the first man to jump out and reach land, said Mr. Kemp, was the officer who had been standing in the bows, Lieutenant Duncan Chapman, formerly a paymaster of Brisbane. In July 1915, Chapman wrote to his brother: “I happened to be in the first boat to reach shore, and, being in the bow at the time, was the first man to get ashore", and the evidence is that this statement was right. Charles Bean continues,” the men who landed with Chapman and in the next ten minutes had little time to wonder whether they were first or foremost. Lieutenant Duncan Chapman, was a 26 year old Paymaster enlisting from Whytecliffe, Albion, Brisbane but originally born and bred in Maryborough Queensland.. He enlisted with the AIF on 21 August 1914 and was allotted to the 9th Battalion, C Company (the original C Company was amalgamated to become part of A Company at the Landing). They embarked from Brisbane, Queensland, on board Transport A5 Omrah on 24 September 1914. When the Battalion was divided into two in 1916 he transferred to the newly formed 49th Battalion as a Captain, and was promoted to Major and transferred to the 45th Battalion. He was killed by a shell burst early on August 6, 1916 at Pozieres, on a ridge described as more soaked in Australian sacrifice than any other place on earth. Charles Bean supported the Chapman claim and mentioned Frank Kemp (after the war he used Kemp as a alias not sure why, his real surname was Coe), a scout sergeant with the 9th Battalion, as witness. A Letter (see below) that Chapman had written to his Brother while on Gallpoli was also considered . At the centennial 2015, Anzac Day Ceremonies in Maryborough Queensland a statue was unveiled to commemorate Duncan Chapman's landing at Gallipoli. His landing is also remembered in great detail at the - 9th Battalions War Memorial Museum Collection Milne Bay Memorial Library & Research Centre Chermside Historical Precinct, 61 Kittyhawk Drive, Chermside. photographs below shown. Obviously, one of the most highly regarded of Australian Service medals. In 1950, James 'Jim' Bostock was interviewed by a newspaper reporter, at the time 54-year-old James Bostock was a Brisbane manager of the Melbourne Manufacturing and Importing Company. He had enlisted for World War I service when he was 18 years of age and had also served in World War II. He was asked where did he enlist? "I was living in a little town called Dulacoa out in Western Queensland, at the time. I was at a prickly pear experiment Station where we were trying to find out how to control the growth of the pest." He was on leave in Brisbane when war was declared, and was one of the first to enlist at the Town Hall. "One of my grandfathers had been a Major General in the British Army, my mother and father were dead, had no ties, so I just joined up." By 1914, James Bostock was in camp Enoggera Brisbane. The 1st Australian contingent had sailed, and James became one of the first reinforcements for the 9th Battalion. After less than 2 months training, he joined the Battalion at Mena Camp just outside of Cairo Egypt. When it was found that James had experience in signaling, he was posted to No 3 Platoon Sigs. From Mena, James went to Lemnos, and then to Anzac Cove. And on the date we all know so well, 25th of April 1915, James Bostock became the second man to land on Gallipoli. He was just behind Lieutenant Chapman, who is officially credited with having been the first man to land. Bostock suffered shrapnel wound in the legs just outside Lone Pine early in August 1915, and after treatment at Malta and England was sent back to Australia permanently disabled. He was discharged in 1916. But Bostock was not finished with the Army. He discarded his crutches for sticks then discarded the sticks and got into the home services to be stationed at Victoria Barracks. While there, he and another mate were made Sergeants it was an important promotion for both of them. It was important because to use James's own words: " we were able to tear the guts out of our medical sheets and get back in the AIF as medically 'A One' fit". Soon after this Bostock was on the seas again, but not before he had married a Brisbane girl. However, there was to be no more action for him. He arrived in England on November 11, 1918 - the day the war ended. Today (1950) Mr Bostock has 3 children and grandchild. His eldest son, Robert, served in New Guinea in World War II. His one fear in life is that he should ever become a flag waver - waving the boys off, and waving them home again. He proved that in the last war when he quickly joined the full-time Volunteer Defence Corps to become a commissioned officer at Rockhampton Qld. Mr Bostock said that when he received his wound it was like someone giving him a thump with a big board. He stated that the worst feature of Gallipoli was the lice he said," Gallipoli was lousy, and we had to eat, sleep, and fight in the same close conditions our hygiene facilities were frightful. During the 3 months I was at Gallipoli we just pigged it, and the only way to get out was to be carried out." In 1954, Jim Bostock once again found himself on the front page of the Courier Mail. This time the column again related to his service on Gallipoli and his meeting with Fred Fox an old veteran of the 9th Battalion. The article comments about the meeting saying that Fred Fox "hit the beach" behind him. Thus by association it would seem that 389 Private Frederick Y. FOX, A Company was also in the 1st boat to land on Gallipoli. Later on the 8 February 1954, Norman Harvey author of 'From Anzac to the Hindenburg Line The History Of the 9th Battalion AIF'. Sent a letter to the editor regarding the Courier Mail "Day by Day" claim which can be seen below right. Mr Harvey disputed the claim reinstating that it was his belief and that of Charles Bean that Duncan Chapman is the first ashore on 25 April 1915. He also stated that the 9th Battalion Medical Officer late Colonel A. Graham Butler should be added to the list of those already mentioned on page 40 of the 9th Battalion history. He also noted in the last line of his letter that Mr Fred Fox should be included. The above newspaper article was probably a misquote, as obviously Jim Bostock knew that he was not the first man ashore. Jim Bostock suffered from his old war injuries all his life. At times receiving the disability pension. He was an active participant in many aspects of the RSL and a committee member of the 9th Battalion AIF Association. He died on the 15 August 1982. The Group Photograph below was taken at Percy (Dad) Townshend 100th Birthday party which was attended by some 9th Battalion Association AIF Committee/members including Jim Bostock - 5th from left behind Dad Townshend. Clarrie Wrench author Campaigning with The Fighting Ninth third from left. Dad Townsend was 100 years old in 1955 he had an incredible life story. I have put together a story about this man on a post. According to newspaper records he was a Zulu war veteran, he was also a Boer war veteran, he was born in 1855. Joined up with the AIF understating his age saying that he is 42 years old when he was actually 60 years old. Landed at Gallipoli on the 1st day, was in the trenches at Pozieres. Awarded the military medal for gallantry in the field, probably he died without ever knowing he was a Military Medal recipient. Initially, Coe enlisted with the Light Horse but transferred to the 9th Battalion on 21 August 1914 aged 29. He Landed on Gallipoli as a Battalion Scout Sergeant and was there for 10 days before reporting sick with dysentery. He was wounded on 2 June 1916 with a bullet wound to his left arm. After recovery it was deemed he had a partial permanent disability but returned to the front. He was discharged on 19 March 1918 and returned to farming bananas in the Redlands area near Brisbane. He married in 1925 his wife's name was Florence Helen Keeble but by 1940 they were living apart. In a letter dated 22 September 1940, when he was making application for a pension, Coe said that his only occupation was as part of the shovel gang and as he had a fracture of his arm (war related) this had put him out of this type of labour. He said this was the only labour offering to a broke farmer. In 1929 he was a volunteer wharf labourer but had his chest crushed by a fall of cases. Directly after WW1, he went onto a farm 'struggled along' but could not make a go of it and quit in 1934 - after 1934 he was a labourer. He used an alias surname of Kemp and from time to time used Frederick Charles or Francis Charles as his Christian names. There is no suggestion as to why he done this. Obviously, Charles Bean accepted his story regarding The Landing. In Coe's statement to Charles Bean he refers to, " 616 Private AK Wilson of the scouts was taking my pack off when the first shot rang out: a pause: then seven more". Thus by association 616 Private AK Wilson could be included as being one of the men in the first boat. In 1915, Coe wrote a letter to a newspaper stating the facts about the battle fought on the left flank on Sunday, 25 April 1915. It was subsequently published in Australian newspapers. Scout Sergeant Coe ( after the war also known as Kemp) writes from Hospital. How Major B Robertson and Lieut. Rigby Died on Baby 700 later in the morning 25th April 1915. Some of the English newspapers recently published the following: -'In the Deaconess Hospital, in Alexandria, recovering from his wound, is Major Dawson, .of the New Zealanders. For two days Major Dawson with only 150 men -Australian and New Zealanders-held the corner of the second ridge at a Sari Bahr against tremendous odds. 'This was at a very critical moment, when the Turks had come sweeping on in great force and there seemed every probability of the British being driven back to the beach, where, of course, nothing could have saved them. Throughout the night Dawson’s men kept up a continual battle, every man shouting orders of some sort or other, and the Turks were led to believe that they were confronted by a considerable force. At any moment the Turks could have swept the small force from its position, but British bluff and a courageous spirit saved the day. Referring to this incident Sergt. Coe, of the 9th Battalion Scouts (who remarks that he was the second man to land at Gallipoli), writes from the First Australian General Hospital: -'"In justice to the late Major Beresford Robertson, Lieut. Rigby, and the men who fell with them, and who consequently cannot speak for themselves, and as one of the very few of the survivors, I will attempt to give their friends an idea of what they did. 'Not that Major Dawson and the men with him did not do a grand thing, but the part done before was even grander, for it was accomplished with about only 70 men. We cleared the second ridge by 10 o'clock, and it was at 2 o'clock we got it heavy. We were on the extreme left flank, and. at 2.30 the Turks put six battalions on to us. We, on the left, got a goodly share of them, as it was the key of the position, for if they beat us back they could have enfiladed the centre and right, so there was no retiring where we were. Major Robertson was doing his utmost to get reinforcements up to us, but the shrapnel was so thick that a certain regiment was unable to come up to our aid. Major Robertson told me to hold a trench with 32 men (it was a Turkish trench on the extreme left second ridge), and went away to get reinforcements for us. He was bowled over by a burst of shrapnel, and died as a brave gentleman. Lieut. Rigby got a bullet soon afterwards, and shrapnel completed his short career as a soldier- a very short one, but he died another good example to all, in the very first line of fire, where he had been all the day. At half-past 5, out of the 33 we had in the trench on the left, only two were left, and we were forced to retire, expecting death at any moment. Then down below we heard the glorious cry ring out, 'Come on, the Otago Regiment!' Shall I ever forget it? Up they came, and we dug in on the first ridge, and with Major Dawson's men held the enemy. Of our original 70, under Major Robertson, I think only six are left." Clear up some possible confusion there were two Major Robertson in the 9th Battalion on the day of landing, they were related. Major J C Robertson was with the HQ ( received a bullet wound to chest on landing) his boat of the 1st wave landed on the southern side of Ari Burnu and Major S B Robertson later killed on Baby 700 was Commander of B Company. Coe refers to Major S B Robertson above (went by his second name Beresford). Major S B Robertson’s brother, Gordon also served as the Chaplin attached to the 9th Battalion. William Alexander Pollock was 37 years of age when he enlisted in the 9th Battalion A Company on the 22nd August 1914. He had only been in Australia for two years. He was an Irishmen. He lived at 1 Hope Street South Brisbane where he was employed as a general labourer. Upon joining William would have been looked upon favorably as he had 12 years previous military experience with the Royal Inniskilling Fusiliers. On the 25th April 1915 Pollock was witnessed as being in the first boat ashore and thus one of the first men ashore at Ari Burnu Gallipoli. On the 30th April 1915 at the beach roll call he was noted as being missing. On the 8th June 1915, a Field Service Enquiry concluded he was Killed in Action on the 25th April 1915. His mother and sister were living in a Scotland at the time. Newspaper reports initially attributed the honour of being the first man ashore to 1179 Lance Sergeant Joseph Stratford from Lismore member of the 9th Battalion. However, Charles Bean never gave any credence to this story - not that can be seen in the official histories.The War Memorial says, "however the claim was later questioned by the official historian Charles Bean". 1179 Joseph Stratford was a 32 year old grocer from Richmond River near Lismore New South Wales. However, he had been working as a cane cutter in North Queensland before enlisting at Innisfail. He embarked 22nd December 1914 on the HMAT Themistocles A32 with the 1st reinforcements of the 9th Battalion. On arrival in Egypt he was assigned to B Company as Lance Sergeant on 9th February 1915. He was a member of “B” Company 9th Battalion commanded by Major S B Robertson. As a member of “B” Company he would have been in the boats of the 1st wave. There was an eyewitness to Stratford being the first to go ashore from his boat. This witness was 1200 Studley A.Gahan a member of the “B” Company 9th Battalion. In a news report, which was reported in many newspapers throughout Australia, Gahan said that Stratford was the 1st ashore at Gallipoli followed by Lieutenant Jones (Lieutenant Lancelot Alban Jones “B” Company) and then himself. Stratford was killed in action on that first day and his body was never recovered. His records show that initially he was stated as wounded. His family continued to look for him the rest of the war. He was stated as missing for several years. May be possible, that he was taken on board a hospital ship but later dying and was buried at sea without formal identification. On that first day it was a hectic time for the wounded and more so for the people who looked after them. The Sydney Mail wrote an article about Stratford being the first Australian soldier ashore on Gallipoli and went further to say that he was to be awarded the Victoria Cross for gallantry. On the landing, he threw himself onto an Ottoman machine gun. Although his 9th Battalion mates ( mostly men of the 1st Reinforcements) had seen the article no one interviewed did actually witness the act of gallantry. It was somewhat a mystery where the report of the awarding of the VC had originated. As a recognition of Stratford’s sacrifice, a tiny north Queensland school near Innisfail was named Stratvell combining the names of Stratford and Edith Cavell, a British nurse executed by the Germans in 1915. In 2005, the Sun Herald reported the family of Joseph Stratford found further evidence in old records. Old wartime letters from Stratford’s mates testified their friendship to this great soldier. Private Gahan wrote: "There was not a man amongst us who did not love and look up to him. He was fair and straight. I felt when he did not answer the roll call that I had lost an elder brother." Corporal Williams, from Killarney, wrote: "He was a true and loyal friend, a gallant soldier and a gentleman." Private E. Turner wrote: "Many a man has lost a true friend in losing him." Other witnesses said Stratford jumped off the boat and went straight underwater, the weight of his pack and weapons dragging him down. Many died this way, but Stratford managed to shrug off his heavy pack and struggle up to the beach. Stratford had only a bayonet attached to his wet rifle but he stormed up the beach at the Turkish guns. During the war, Charles Bean would have known of the Stratford claim. However, Charles Bean seemed not to take the Stratford claim seriously. It is interesting in a newspaper report of the Landing (see above). The writer, Mr N. Parker (C Company 9th Bn) witnessed Stratford being the first ashore but then wrote that they had left from the HMS Beagle into the rowboats. That would mean that Stratford would have been in the second wave that landed 20 minutes later away to the south of the initial landings. If true, this may have been the reason why Bean had disregarded the claims of Stratford. Further evidence suggests this may be true in that the Red Cross Missing reports regarding Stratford are given in the majority by members of D Company 9th Battalion. C Company 9th Battalion as part of the 2nd wave left from HMS Beagle and D Company left from the HMS Colne. To assist in rapidly landing force, the troops were spread over the warships so that almost every boat was employed simultaneously. On Saturday morning, April 24th, two companies of the 9th (A and B) were taken aboard H.M.S. Queen. The attack was to take place at daybreak on Sunday morning. We had a splendid time on the battleship, and the sailors did everything possible to make us welcome. We had three hot meals on the ship and milk in the tea - a change for us as we had been living on bully beef. About 1:00 in the morning we reached our destination, were mustered on deck, and got into the boats. The boat I was in held about 50 - our platoon of 30 men, together with scouts and a few ambulance men. We were tied to a steam pinnace, to other small boats being tied on behind us. We hung on about for the moon to set, and the other ships to drop their troops. At last we started. In the distance we could just distinguish of the strings of boats, all making for the same direction, the warships accompanying as part of the way. When we reached Shallow water the pinnace cast us off and we got the oars out. We thought we were going to land unopposed. Suddenly a single shot rang out, then dead silence for while, and the Turks opened up on us. They were entrenched at the top of the cliffs, right in front of us. Every detail of the landing had been carefully planned out beforehand, my section, with No.1, having the place of honour. We were to land, form up on the beach, drop our packs, fixed bayonets, load magazines, deploy and change direction to the right, attacking the trenches about daybreak. It is always the unexpected which happens, and we carried the last phase first. We jumped out of the boats up to our waists in water, waded ashore, and took what cover we could at the base of the cliffs. There was no room for me at the foot of the cliffs, so I had to lie out on the open beach. I fixed my bayonet, but the movement caught the attention of a sniper away on my right, who opened out on me. When he had finished, I commenced loading my magazine. I had got a clip in, and was just getting another, when my particular Turk saw me move again, and I spent the most uncomfortable time of my life. The above map was found in the Maryborough Military and Colonial Museum it has an excellent representation of where boats landed. thanks, initially, mainly written as a path to ID soldiers in the first wave, "How to Find if a Soldier was in the First Wave Landing at Gallipoli?" Although, has enlarged with historical aspects of the members in the very first boat to land.